It’s time to start dreaming about a fabulous signature cocktails.. and why not about a cocktail, in Barcelona, on a rooftop bar? How does this sound to you? Ok, I am French, but I won’t deny my Spanish nationality either, my father being Spanish and me growing up in Catalonia! Do not call me patriotic, I am just pretty much convinced Barcelona is one of the best cities in the world for holidays, for work, for parties, for culture and romance! Vibrant and modern, multicultural, dynamic and ultra beautiful; Barcelona is the perfect weekend get-away from your routines (or one way only ticket destination). Explore the endless modernist monuments and architecture, get lost in the mystery of the Gothic old town, treat yourself to the most exciting gastronomy and … party! Barcelona will please any type of holiday and party seeker! Indeed, Barcelona is paradise to cultural voyageurs, history amateurs, sun & beach addicts, high spending 5 star and shopping maniacs or.. to party animals. You just chose the type of vacation you want.. and Barcelona will deliver! Like I have just mentioned above.. the image of a beautiful cocktail just popped into my mind.. so, let me tell you about my favorite rooftop lounge bars where I always make sure I stop for incredible cocktail times.. Indeed, Barcelona has one of the most extensive summer terraces bars and night club’s offer in Europe (if you have done them all, you can always get a ferry straight to Ibiza from the Olympic Port), my favorite being the city top roof lounge bars! Don’t forget Barcelona is made of outstanding architecture so rooftop terraces are really special over there! To me, these are the best escape from the busy streets at night and, like in all towns, the most meeting points for food, drinks or parties! You will find this beautiful rooftop restaurant and bar on the last floor of the Hotel 1898. Overlooking the ionic Ramblas, you can just pop up for a light tapa or a burger brunch during day time (they also serve breakfast).. or enjoy the lights of Barcelona by night with a glass, or two, of cava. The seating area is quite glamorous and very comfortable, but the very best of this lounge bar are the views: 360° views of central Barcelona and Plaça Catalunya. I love popping up for a fresh drink during the day whenever I feel like getting away from the buzzing shopping area, however it remains one of the most beautiful spots for a special evening in Barcelona center. But just bear in mind The Isabela Terrace is only open during summer time so from May to October.. yes.. this is Spain! Loooong summer! I do not go there to escape from the hustle and bustle of central Barcelona but to find the buzz and vibrant music! Of course, you can go during the day and have some delicious tapas and even freshly squeezed smoothies while getting one of the best views in town but this rooftop bar is truly surprising by night! Once again, the Pulitzer Hotel is very central –close to the Ramblas and Plaça Catalunya- so the location and views are unbeatable. The atmosphere is cool, trendy, relax but with the glamorous touch of a city hotel rooftop lounge! If you are seeking for a different party night do not hesitate, this spot offers live music and DJ sets from Thursday to Saturday and it is open until 1am on Thursdays and 2am on Fridays and Saturdays. The Pulitzer Terrace is just the right spot to hit in town! 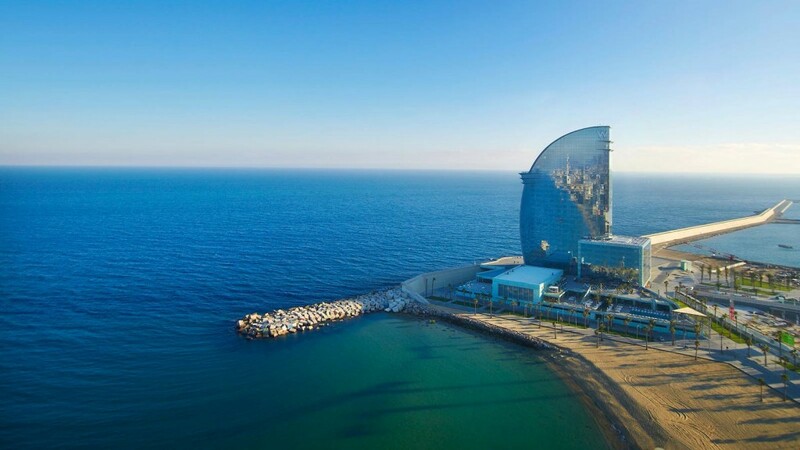 The Eclipse is the panoramic lounge of the most Iconic hotel in Barcelona, the W Hotel. Catalans call it the “Hotel Vela”, as it looks like the wing of a yacht on the sea (la vela). Very popular, I am sure you know which hotel I am talking about ! The hotel is not in the city center but on the extreme side of the Barceloneta area. You can walk there, but if you are on your best party shoes I would recommend you get a taxi from Las Ramblas or the city center. The Eclipse Lounge is on the 26th floor of this world-wide known luxury hotel. So, what to expect? I love the exclusive and luxurious setting and the signature cocktails but the views by night are not the best: you will be facing either the dark Mediterranean sea, either the industrial port.. ok, yes, you can catch the beauty of the city lights on the background from a bird-eye perspective, so pretty impressive still! But the Eclipse is more known for being a glamorous nightclub. Live DJ, terrific sound, crazy atmosphere and pretty people until early hours of the morning… So, I would advise you to try the Eclipse any time of the year for some sunset views and great drinks or for a very sophisticated and glamorous crazy night! The Blue View is something different to try, especially if you want a chilled out special time. 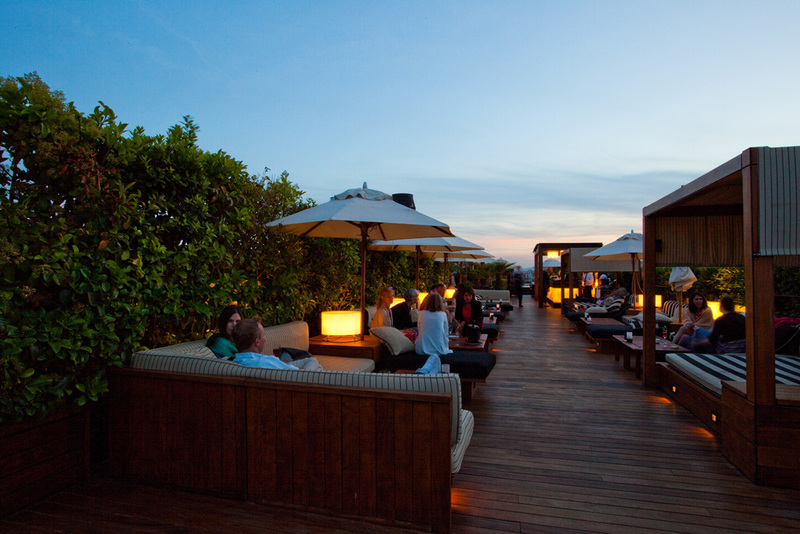 This summer rooftop is located on the terrace of the historic and very respected 5 star Hotel Casa Fuster. You will easily find the hotel at the top end of the famous Passeig de Gracia, an exclusive residential and business neighbourhood. This time, you will have the chance to observe Barcelona from a different angle: La Pedrera, casa Batllo and the iconic avenue… all from a very chic terrace with beautiful signature cocktails! At the end of the day, being at the Blue View is part of your cultural “must-see” architectural sights: Casa Fuster, a residential palace, was designed by the modernist architect Lluís Domenech i Montaner. So get your camera ready and get lost in a modernist interior and mind-blowing Barcelona views! 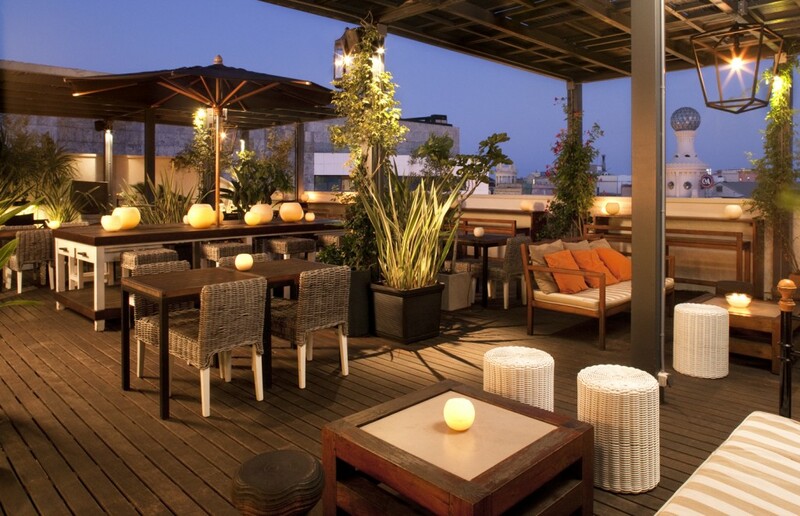 Now time has come to tell you about my personal favorite rooftop lounge in Barcelona. This is a subjective point of view… however I think you should definitely pop by… So, what makes it so special? Essentially the views: you can overlook directly to the Pedrera’s roof –also called Casa Milà (you know, the famous Gaudi’s monument with Star Wars-like statues on the top). The illuminated Sagrada Familia will also be part of the panoramic picture. This, again, is the summer rooftop bar of a luxurious hotel, Condes de Barcelona so you can expect design seats, light snacks and late night food service, chill out glamorous music, beautiful people and bubbles, lots of bubbles! This hotel is located on Passeig de Gracia, as I said, across one of Gaudi’s most acclaimed monuments, so if you are in a visit or shopping mode stop by and enjoy an exclusive coffee time up there.. or get ready for an urban-chic night Alaire (means, on the air, flying in Spanish). Tagged Barcelona, cocktail bars, Luxury Experiences, rooftops. « Happy National Day La France!